Starting February 16th, 2017 and live each Thursday at 6pm EST for the following 10 weeks. Archives will be available within a few hours of the conclusion of each course. 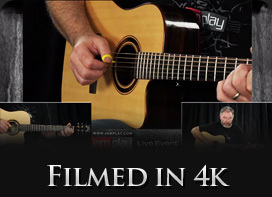 This course will show you just how amazing the acoustic guitar can truly be. Do you play acoustic guitar and feel that everything you play somehow sounds the same? If so, this course is for you. 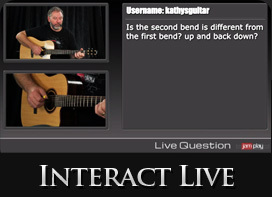 Justin will talk about some choice ways to inject expressive emotion into your playing. We will cover how using basic techniques such as dynamics, tone control, hammer-ons, pull-offs and fingerpicking can enhance any acoustic progression or song. 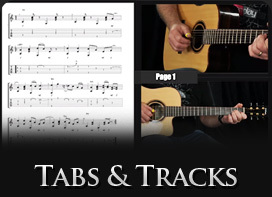 We will then move on and introduce the concept of using partial and full capos, alternate tunings and more advanced right and left hand techniques. This course truly has something for every player, beginner and seasoned alike. Get access to this live course with a full JamPlay Membership, which includes access to all past live courses and over 5,400 on-demand lessons. This also includes all teaching tools, chord and scale libraries, along with gear giveaways, teacher reviews, and daily live lessons. Chord progressions sounding stale? Don't fret; Justin will show you simple techniques to modify your dynamics and tone that will give your progressions an entirely new life. These simple techniques will add untold expressiveness to your playing. Simply adding hammer-ons and pull-offs to chords might sound rather simple, but you might be surprised just how much flavor and variety it adds to your playing. This week we will analyze these techniques in depth. Strumming is a lot of fun, but sometimes you just need a little bit of variety. Injecting some fingerpicking into your progressions and songs will add a new layer of texture and emotion. Justin will talk all about it this week. This week we will return to the world of integrating fingerpicking patterns with your chord progressions, arrangements and songs. Things will get a little more exciting this week. Ready for things to sound different? Good. This week is all about using the capo--both partial and regular--to completely change the sound of your progressions and arrangements. You might be surprised how much flexibility this offers. Each altered tuning comes with a personality of it's own. If your music sounds stale no matter how hard you try, it might be time to explore altered tunings. Justin gives a beginners crash course on the concept this week. In last week's lesson we took a look at DADGAD tuning. This week, we will stay in DADGAD but explore playing in the key of G.
This week we take a look at another exciting altered tuning: CGDGBD. Don't be intimidated by altered tunings, in many cases they are easier than standard. This week we return to the world of CGDGBD tuning, but in the key of C. There's some fun, exciting and easy tricks in this tuning. Still feeling like your music is stale? In this lesson we take a look at some advanced left and right hand techniques that will add flavor and texture to your playing.